A move from a modern penthouse in the city to a home in the country can be stressful, so it was important to design the master bathroom interior to accommodate relaxing design and function. Everyone wants a spa in their home. One of the most common requests from clients when we begin an interior design project of any bathroom is ‘make it feel like a spa.’ (Read our recent article on a Spa-like Guest Bathroom we did.) Who could blame anyone for wanting that spa-like escape in their master bathroom? Not us, that’s for sure! So the trick for us as Interior Designers is to ask lots of questions before we begin the design process. It’s our job to learn what spa-like bathroom means to every client–and it can mean a variety of different things and can guide our recommendations for colors, construction materials, fixtures, etc. In this particular case, as you can see in the photos, the bathroom design style was outdated. The client wanted to be comfortable in the space. The only parameters we had to work within were keeping the existing windows and corner tub. 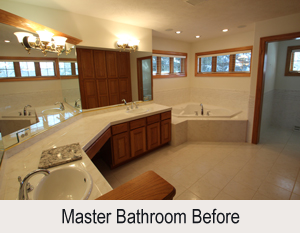 Interior design decisions in creating the relaxed, spa feel in a master bath. Interior design choices must be different for every client, but in this case, here are some of the choices we made and why. Raising the height of the vanity. The existing vanity was too low, forcing our clients to lean over too far while brushing their teeth, putting on make-up, washing their hands. That puts stress on the lower back and can make a person uncomfortable in the space. We raised the vanity to eliminate that unconscious stress and as a bonus added storage space. Installing larger mirrors over the vanity. Mirrors in a bathroom are not only a functional necessity, but they can help visually increase a space that is often smaller and can feel cramped. The existing mirrors, while extending the length of the vanity were partially “framed” with a lowered crown molding. This made the room feel smaller. It also contributed to the dated look of the room. We installed new mirrors all the way to the ceiling, wrapping them with a simple wood frame. This adds visual height to the room and gives it a more spacious feel. New light fixtures. The old light fixtures were different sizes and mounted at different heights. This disrupted the linear feel of the long vanity and only reflected light toward the ceiling, further contributing to that small bathroom feel. The new chrome “on trend” wall sconces are mounted on the mirrors, which then reflects the light around the room, making it feel much more spacious. Updating the “tile”. A low ceramic tile surrounded the corner tub and made it look very boxy and contained. We used Asian stones on the wall and brought them up to mid-window height, finishing it with a small corner shelf helped to avoid that awkward transition between tile and painted surface. Increasing the size of the shower enclosure. As small, cramped shower definitely detracts from the calm escape of the master bathroom. Here we increase the size of the shower physically by extending the footprint, but also by surrounding it with glass walls, which make it appear even larger. The same Asian stones we used above the corner tub were also used as decorative accents in the shower area for design and continuity. Granite vanity top. The existing vanity top was similar in color and texture to the rest of the room. In the new bathroom we not only added visual variety with a striking granite, but also pulled in some of the colors in the Asian stones. We also incorporated a makeup area per the client’s request. Add decorative cabinet hardware. The existing vanity had no door pulls or drawer pulls, leaving it appear unfinished. In the new design we added brushed pewter hardware with clean lines and simple style. Elongated floor tiles. The existing square floor tiles also made the bathroom seem smaller than it actually was. We installed elongated or rectangular tiles “stretching” the room and drawing the eye across to the corner tub, which was re-tiled in the same color as the floor. We also were able to re-shape and re-size the tub surround and added a towel bar to the back of the vanity where there was none before. 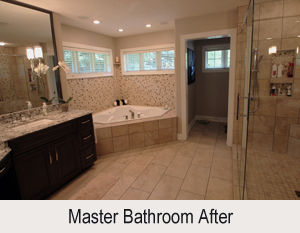 Each of these design changes gave the master bathroom that spa-like feel that our clients longed for. They can now relax and enjoy their new master bathroom.